Diffused Projekt logo in white, stylishly displayed on this Black “Baby Tee” shirt. A nice shirt for women as well as your gothic children. This is a recent addition to our selection of shirts, inspired by your requests for something more petite for women. We also have a nice Spaghetti Strap shirt (see the link below). 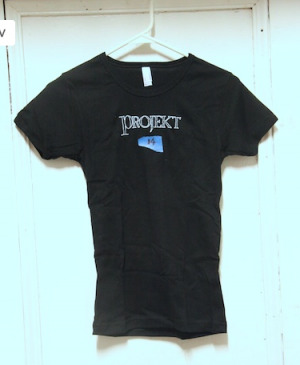 Please send us photos that show you wearing a Projekt shirt and we will add them to our website….